We all have moments when we feel alone. In a world where everyone seems to be connected, it seems ironic that studies show we’re more isolated than ever before. That sense of separateness can create cracks that let lies slip into our hearts. Can we shudder together at the ugliness of those words? And then can we say as sisters that we won’t listen to them anymore? You are not alone. I am not alone. Even in the moments when we feel like we are. You do belong. You are wanted. You add value in ways no one else can. That’s the way God created it to be. In the beginning, he said it wasn’t good for man to be alone so he created relationships with other human beings. He also promised that he would personally always be with us. Here’s the catch: we still have the power to shut our hearts. We can say, “I feel alone sometimes, so there must be something wrong with me. I will hide away until I can become perfect. Then I will reveal who I really am.” We can go through a lifetime of church and work and parties this way—showing up but never really showing who we are. Is this hard? Oh yes. Is it risky? Love always is. Yet it’s also the only way to dissolve the illusion that we’re alone, and to help others do the same. We’re better, stronger, more fully alive together. I need you. You need me. We need each other. Welcome to Coffee for Your Heart! The concept is simple: You’re an encourager so I’m asking you to pour out a little love to others with your words every Wednesday. The writing prompt I gave you last week was, “You’re not alone.” Now it’s time to link up your blog post or leave a comment sharing how you used that prompt to encourage someone this week! The next writing prompt is this question: “What are the encouraging words you want to hear when you’re having a hard day?” Write a blog post on that theme and link it up here next Wednesday. And even if you don’t have a blog, we’d love for you to join us by leaving a comment that day. p.s. If you’re linking up here, you should check out the Tell His Story link-up with Jennifer Dukes Lee and share your post there too! I’m so glad this comforted your niece, Beth! Thank you for sharing this here! This is such an important message! 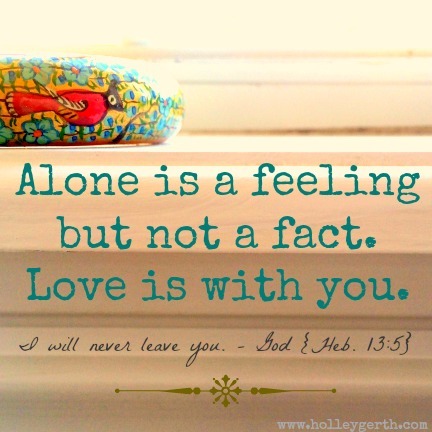 We might feel lonely, but God promised that we are never alone! There is no shame in admitting we aren’t perfect. We aren’t perfect, but His love is! “We aren’t perfect but His love is!” Yes and amen. Love how you said that, Jennifer! Holley, as always, wonderful and glorious truth in your words. I have enjoyed these journaling prompts and link up on Wednesdays. It’s challenging to write words of faith, words I haven’t dared to write before. Thank you! Good morning all.holly,I am New to the group and have really enjoyed your posts and especially today’s! The Lord showed me yrs ago that he even LOVES our imperfections and wants us to embrace them to experience freedom in a whole new level and to be able to walk in grace with everyone.today, as I sit here, suffering through a rotten headcold, having not showered in days or wore any make up in days,I am reminded that while yes I do feel broken and messy (red nose included) ,I am not alone,I am loved and even while under the weather,I can still encourage others…that’s why I’m introducing this blog to my sis….for I think it’ll truly comfort and bless her.Thanks so much! Keep writing those brave words, friend! Cheering you on! Goosebumps…tears….conviction….in that order….but then finally….hope and determination from this encouragement today….thank you! Wow, this is so where I am in life right now. My word for the year is Share and that is so hard. I keep me very closed off and protected. I have for years. I am learning to share me – the real, true, honest me – with others. Difficult action but sweet results. Praying for you now as you do the courageous work of sharing who you really are. You are and will be a blessing to many others! Holly, I am feeling lost and alone this morning and this was something I needed to hear. I still need some prayers because as much as I know in my head God is with me, I am having a hard time accepting it in my heart. Some days it’s easier than others. My relationships in the past have definitely had an impact on this challenge in my life and my current relationship, even though it’s much better than the one I was in with my ex-husband, is still causing me to question God’s plan for my life. I have had times where I felt so close to Him and felt his presence on a daily basis, but over the past couple of weeks I’ve had a hard time feeling close to Him. I even struggle with how to pray some days. I hear Him speaking through you to me so thank you for your message today. Diane, I understand this space so well. I remember a time in the not so distant past when I really wasn’t sure I believed anymore and I felt very far away from Him. I didn’t feel Him and I doubted if He was there but He was still with me. I encourage you to re-read Holley’s post as often as you need to and may they continue to breathe hope and encouragement into your heart. Sending you some extra love from across the blogsphere. Diane, I wish I could give you a big hug today. I can relate to times when God feels far away. Know that it’s part of being human to have those times and that we all go through them. You are loved and I’m praying you know that in the very deepest part of who you are more and more. That’s why I have to read my Bible daily and get those Scriptures written on my heart. His Word is fact, not my feelings. He promises to never leave me – that’s a fact. I feel alone – that’s a lie. The heart is deceitful, another fact. I can’t trust my feelings: they go this way and that, up and down by the hour sometimes! But I can trust Him – He never changes. Amen? Beautiful post. I wish I knew this growing up. Though I had a caring, loving family, I felt alone at times. I wish I knew that the emptiness can only be filled with God; His love, His mercy, His word, His passion, His power in us. But I know now, and I am happy to know that He was with me all along, I just didn’t know it! I’m so glad you joined in the link-up this week, Sheila! It’s a joy to have you here! Hugs right back at you, Juli. Thanks for sharing your heart with us today! Thank you, Holley, for this comforting message. I’m working at revealing who I really am, just as I am in all my imperfectness, but it can be so difficult when those age-old lies slip in through the cracks. Thanks for reminding me to focus on truth instead of insecure feelings. I think revealing who we really are is a lifelong process that’s only complete in heaven when we’re finally truly all we long to be. Cheering you on along the way, brave friend! Holley I just want to say that I am LOVING these link ups and all the amazing encouragement that is just pouring out… until our cups overflow! (Did you see what I did there?) I also love that you pointed others to Jennifers’ link up too! You are nothing if you are not consistently encouraging, my friend! You are such an encourager. You always inspire me with your words of Faith and Hope and Love! Thank You. When I saw the prompt for this week I thought of my Aunt and decided to let her know she is never alone so I sent her a Big God Hug and a little gift from DaySpring. She was delighted and so was I when she called me. Since my Uncle died my Aunt keeps herself so Filled Up with the Lord, she goes to church/church circles, is a volunteer at her local hospital gift shop, knits hats and scarves that she sells and always stays true to herself. She is an amazing Lady and I Love her!!! To all my God Loving “Sisters” I send you a Big God Hug from me. That is a wonderful way to live out this week’s prompt, Connie! I’m sure your Aunt was blessed and encouraged! Thanks Holley for sharing from your heart, your “realness” helps all to know we are not the only “Dreamers” locking away these thoughts and feelings in our hearts! Please everyone out there use today’s precious words of encouragement to spur ourselves and others on the LIVE as Jesus would have us to LIVE! “showing up but never really showing who we are.” I have lived the better part of my adult life like this and it sucked. Learning to allow myself to be seen and known, showing the me that I really am instead of the me people think I “should” be. So hard sometimes. Thanks for sharing these words. Oh my, just realized I linked up the wrong post for the prompt but perhaps God meant for it to be that way. Thank you for the constant reminder and encouragement of God’s nearness in circumstance Holley. Your words are truly a gift. There’s no way to really link-up wrong, girl, the words you shared were the ones I’m sure were needed by someone today. Thank you for being here! “We’re better, stronger, more fully alive together.” Yes, yes, yes. If we could just grasp that truth, we would be more likely to reach out, to be real, to take a risk with one another. Then none of us would be alone. Enjoying this series, Holley! Thank you, Holly, it makes me smile to see your face here each week! Thank you so much Holley for always being a bright light in a dark world. 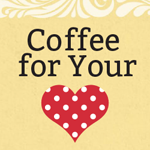 I really need and enjoy your Coffee for the Heart posts! And I often share them on my facebook page. Thank you so much for your kind words and for sharing on facebook, Lina! Grateful for you! Unfortunately it isn’t God that is the problem for me. I know that he accepts me and I am my true self with him. After all, you can’t fool him. But it is often not safe to reveal who you truly are to others in the workplace or even family. That’s where the loneliness creeps in for me. It’s such hard work to always try to be understanding, nice, friendly, etc. Why does it seem that everyone else can be messy, broken, and selfish etc, and I try to be understanding and forgiving back, but when I happen to be that, I don’t get the same slack. This happened to me recently. I was honest about what I was feeling and communicated that, and the person was upset by it and the only way to end it was to ask their forgiveness. Just once, I’d like to be me – and not wind up apologizing for being me – messy, prideful, broken, whatever. Not that I’m glad to be that. But we just are, right? Hey Girl, I hear your heart and the hurt in your words. I so agree that human relationships are the most painful part of this. I’m rereading a book called Safe People by Cloud and Townsend that has helped me a lot. Maybe you would like it too? Thanks for reaching past your fear and continuing to keep your heart open! Thank you for your challenges. Check out my blog for 2 new submissions. First I posted regarding next week’s challenge, second I posted another thought to go along with You’re Not Alone title Alone Yet Not Alone. Please check them out. Thanks for your words of encouragement. Somehow you always send me the words I need to hear at the right time. Today’s was particularly spot-on! Thank you for all that you do for me! Thank you for posting beautiful and encouraging words. Your words are blessings to the soul!! Continue to keep us filled and fueled on His word through your writings. Hi there everyone. Just wanted to share what I’m experiencing. Nearly 17 years ago I lost my husband at 44 to a massive heart attack. I was beyond devastated! I moved back to SC from Florida and after I year of being here I lost my Dad. My youngest is 31 and I live alone. God has been with me and I’ve been active in my church. However, sometimes…..a lot of times, I feel so alone that I ache. I isolate because I listen to those lies that I’m not good enough and no one really cares for me. I just want to ask for your prayers that God will strengthen me and guide me. Lord, please wrap your arms around my sister Carroll right now. I pray that deep inside she would know in a very real way more and more how much she is loved. I pray that you would be her husband, her Father, and her comforter today. Please send people in her life to surround her with love too. In Jesus’ Name, Amen. Your words are so revealing. “We think we will hide away until we are perfect.” This is so one of Satan’s favorite lies. He loves the crippling isolation this causes because the truth is we cannot make ourselves perfect. God shining righteousness through us is our only perfection. Thank you for beautiful words of truth that pull us toward and into relationship and light. Yes, “God shining righteousness through us is our only perfection.” So true and beautifully said! Those words totally sum up my 2013. I felt like that a lot. It has taken a lot of courage to be honest with friends, they know I’m messy and broken but they are still my friends. Thanking God for those great people in my life. Hello, Holly! I am a new follower who linked up to this coffeehouse party for the first time and I just want to say I LOVE this idea. I am a busy single mom blogger who is running around like crazy and barely has time for my friends let alone belonging to a women’s group right now. So this coffee for the soul idea is wonderful because I get a lot of inspiration on the go through blog posts like yours. Thank you.